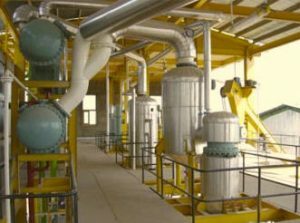 Solvent Extraction is a process which involves extracting oil from oil-bearing materials by treating it with a low boiler solvent as opposed to extracting the oils by mechanical pressing methods (such as expellers, hydraulic presses, etc.) The solvent extraction method recovers almost all the oils and leaves behind only 0.5% to 0.7% residual oil in the raw material. In the case of mechanical pressing the residual oil left in the oil cake may be anywhere from 6% to 14%. The solvent extraction method can be applied directly to any low oil content raw materials. It can also be used to extract pre-pressed oil cakes obtained from high oil content materials. Because of the high percentage of recovered oil, solvent extraction has become the most popular method of extraction of oils and fats. Fat is one of the essential components of the human diet, therefore the demand for oils and fats are increasing with the in-crease in population and standards of living. Today large quantities of oil cakes such as peanut, cottonseed, linseed, kardiseed, neem, castor, mowha, copra, sunflower, etc. are extracted. Direct extraction of rice bran, salseed and soybean is also used. 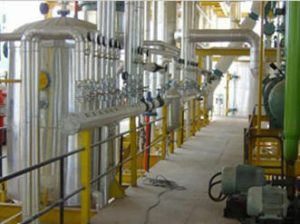 Solvent Extraction is basically a process of diffusion of a solvent into oil-bearing cells of the raw material resulting in a solution of the oil in solvent. Various solvents can be used for extraction. However, after extensive research and consideration of various factors, such as commercial economics, edibility of the various products obtained from extraction, physical properties of the solvent especially its low boiling point etc. Hexane is considered to be the best and it is exclusively used for the purpose. 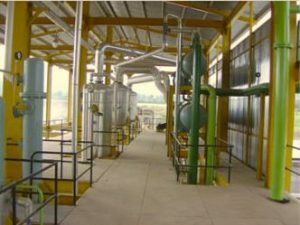 In a nutshell, the extraction process consists of treating the raw material with hexane and recovering the oil by distillation of the resulting solution of oil in hexane called miscella. Evaporation and condensation from the distillation of miscella recovers the hexane absorbed in the material. The hexane thus recovered is reused for extraction. The low boiling point of hexane (67°C / 152°F) and the high solubility of oils and fats in it are the properties exploited in the solvent extraction process. Because of the highly inflammable character of the normal hexane, those stages of process which involve high speed machineries such as material preparation, finishing and bagging are carried out at least 50 feet away from the main extraction plant wherein the remaining processing stages involving handling of the solvent are carried out. For thorough and efficient extraction, it is necessary that each and every oil-bearing cell of the material be brought in contact with the solvent. Therefore, proper preparation of materials prior to extraction is very important to ensure this contact. The smaller the material size, the better is the penetration of the solvent into the oil-bearing cells; but too fine a size will prevent the solvent form percolating through the mass. Therefore an optimum size is to be maintained for best extraction. Hence material preparation methods vary from material to material depending on its oil content, size and physical properties. For high oil content materials (oil content of 15% or more), the following steps of preparation are recommended to make the material suitable for penetration of the solvent into the oil cells as well as for best percolation. Passing the seeds through corrugated roller mills with 3 mm flutes to reduce the size to about 3mm. Heating the broken material to about 80°C with open steam in temperor and humidifying the material to raise the moisture content to about 11 to 12%. Flaking of the humidified material between a pair of plain rolls to 0.25 mm thickness or lower. Conveying the flakes to the extraction system after crisping them firm. Rice bran is a fine floury material and therefore is bound to obstruct the percolation. The best preparation of rice bran for extraction is found to be pelletizing the same after tempering with open steam. The pelletized bran is then crisped in a current of air while conveying to the extractor. Some oilseeds such as cottonseed and soybean can be directly extracted but they are to be decorticated by special equipment to separate the oil-bearing meats from the hulls. The decorticating equipment varies from seed to seed. The decorticated meats are tempered, flaked and the flakes are then sent to extractor after crisping. The prepared material enters the extractor through the rotary air seal. The extractor consists mainly of a very slow moving articulated band conveyor inside a totally enclosed chamber. The band is lined with perforated sheets and porous stainless steel cloth. The mass of the material moving on this band forms a slow moving bed. During the movement of the bed through the extractor it is washed continuously at various points with miscella of decreasing concentrations and finally with a fresh solvent in a counter current manner by means of sprayers kept in a line over the meal bed. The miscella percolates through the perforated bottom and collects in various hoppers kept below the bed. The miscella from the last hopper, which is concentrated, is taken off for distillation. After the fresh solvent wash the material is discharged from the band conveyor into an airtight chain conveyor, which conveys it to the desolventiser. In the desolventiser the material is heated to about 100°C by jacketed steam, and thus the absorbed solvent is evaporated into vapors (boiling point of hexane 67-70°C). 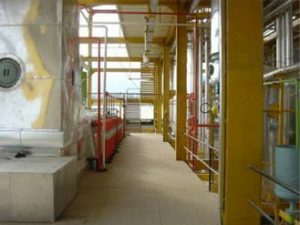 Finally, the material, which is now completely desolventised is continuously discharged through airtight seal into a pneumatic conveyor, which carries into the bagging section. The vapors evolved in the desolventiser are led through a dust catcher wherein they are washed with hot water to a condenser. Some materials, such as cottonseed and soybean extractions are toasted after desolventisation. In these cases both the steps of desolventisation and toasting can be combined into one operation by the use of Desolventiser – Toaster (D. T.) Instead of the tubular jacketed desolventiser. The D.T. consists of a vertical cylindrical vessel with horizon-tal jacketed compartments and a central rotating vertical shaft on which are mounted sweeps in each compartment. The Material to be desolventised and toasted is fed in to the top compartment of D.T and heated with open steam. Open steam condenses a lot of moisture in the material at the same time evaporating the solvent. The moisture up to 14 to 15% is condensed. The material then flows to lower compartment. In lower compartments the material is gradually heated to 115 to 120° C thus evaporating all the solvent, cooking the material and driving away extra moisture. The cooking in presence of moisture destroys undesirable enzymes. The resulting high temperature toasts the material. The solvent and water vapors from various compartments are led first to a dust catcher wherein they are scrubbed with hot water spray to remove fine dust and then led to a condenser to condense the vapors. The desoventised and toasted meal from bottom-most compartment discharges into a redler conveyor.